Ah, the simple life. Pigs with abscesses. Ewes that die at birth. Sheep with mastitis. Rows of lettuce plagued by wire worms. Allergies triggered by the ever present dust and pollen in the fields. Though they make it look simple, life on Horse Drawn Farm for Ken Akopiantz and Kathryn Thomas is anything but. 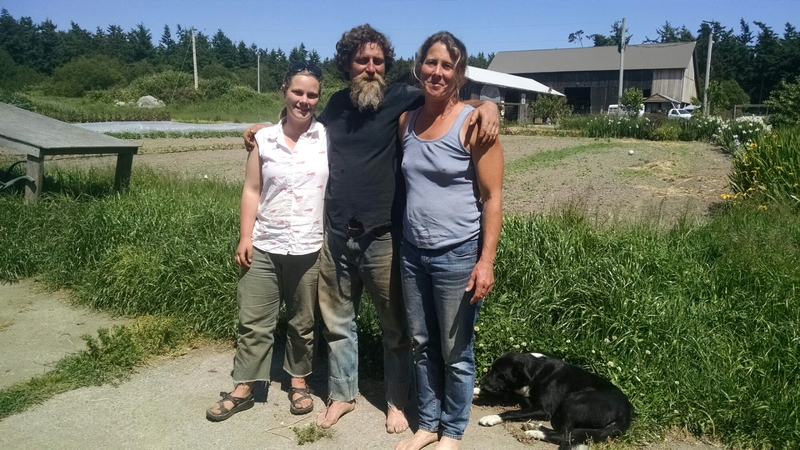 I had lunch the other day with Ken, Kathryn and their long-time employee, Helen O’Brien, to learn about what’s required to run a large sustainable farming operation like Horse Drawn Farm, which sits off of Port Stanley Road on the north end of Lopez Island. While describing the many day-to-day challenges on the farm, Ken laughed as he recalled something a high school friend had said to him recently. “Obviously my life’s not as simple as yours,” she said. Obviously that old friend hasn’t spent much time hanging out at Horse Drawn. Ken and Kathryn talk about sheep mastitis and pig abscesses in the same way many non-farmers might talk about traffic or their day at the office. Their water cooler conversations are a little different: how to deal with the recent infestation of wire worms that has descended on the Pacific Northwest, or perhaps the 35 sheep that need to be butchered next week. Or, when they carve out time to tell me about the genesis of their farm, how small farms like Horse Drawn are critical to long-term, sustainable agriculture for the planet. I got an opportunity to see some of those tools first hand while walking around the farm. 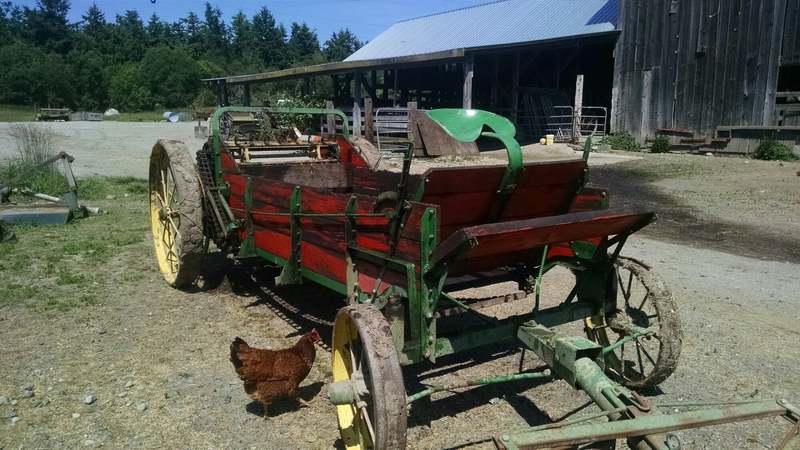 My favorite is the “honey wagon” used to spread manure on the fields. The lot surrounding Horse Drawn is full of plows, hand tools and other implements. But the farm isn’t totally devoid of gas-powered machinery. Chickens roam free among some tractors and trucks in front of the big Horse Drawn barn that provides shelter for some cows, pigs and, of course, the horses. The main property for Horse Drawn takes up 80 acres along Port Stanley Road, where one can often see Ken plowing the fields using a team of horses. In all, Horse Drawn keeps animals on about 200 acres across Lopez, including more than 200 sheep, 100 pigs, 40 egg-laying chickens and dozens of cows, some of which are kept at Swifts Bay Farm, owned by Kathryn’s parents. Horse Drawn runs a milk co-op, which involves island residents splitting the costs of taking care of the cows in exchange for milk produced from milking those cows themselves. Kathryn wasn’t born on Lopez (she’s originally from Seattle), but her family has a long history on the island. In the 1930s, her great aunt and uncle started Camp Nor’wester on the Sperry Peninsula, a camp that still exists today on Johns Island. Kathryn’s parents bought Swift’s Bay Farm when she was 7-years-old, which is when she started spending quite a bit of time on Lopez. She moved to the island full time while she was learning how to be a farrier during college. Kathryn shooed horses on Lopez for several years. She met Ken one day in the late 90s when Ken came walking up her road with his team of horses. Ken is originally from Greenwich, Connecticut – a place that couldn’t be more different from Lopez Island, Washington. He left Greenwich at the age of 17 and began a circuitous route across the U.S., eventually landing on nearby Waldron Island, where he started his vegetable business, Horse Drawn Produce. 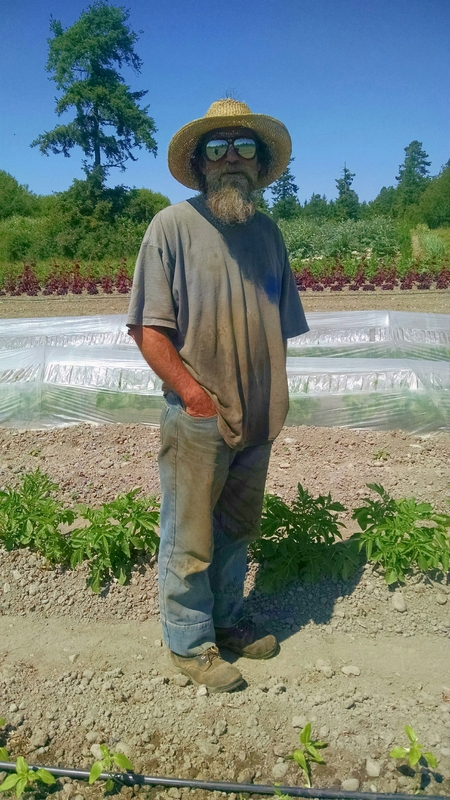 Ken moved to Lopez after buying the old Ellis Ranch from Fred Ellis in 1998. That’s when Horse Drawn Produce became Horse Drawn Farm. Though Kathryn and Ken have long been fixtures on Lopez, Ken recently gained notoriety for spearheading the successful initiative to make the San Juan Islands GMO-free. “GMOs are about corporate control,” said Ken as he recounted what led him to take up the torch to protect the seeds of local farmers. Everything about Horse Drawn is antithetical to anything corporate. 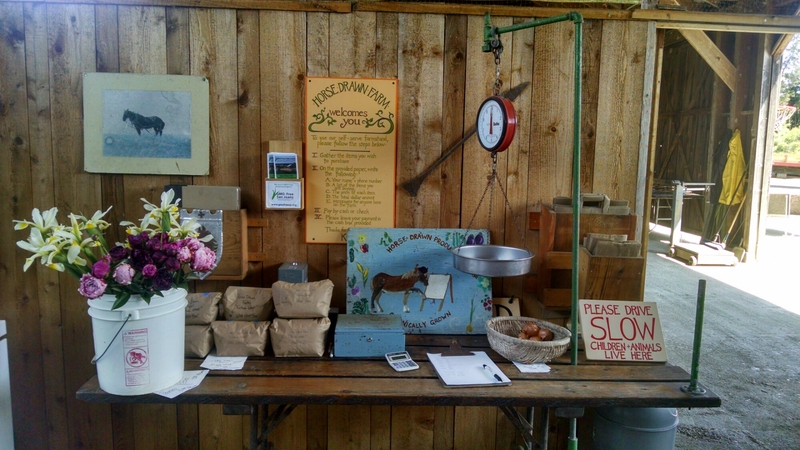 Instead of a cash register to ring up purchases from their produce and meat store, Kathryn and Ken rely on the honor system. Customers weigh their own produce, do the math themselves and leave a check or cash in the box on the counter. I asked if they’ve ever experienced any theft, and the answer was rarely. Once, a group of kids stole $300 in cash from the store and took off down the long driveway while Kathryn watched. Though no one ever wants to lose $300, she said that’s a hell of a lot cheaper than having to pay somebody to work the store. I think a lot of people – farmers and non-farmers alike – share that farmer’s wish. And Horse Drawn represents what those people are looking for. Some might call it the simple life. Those who know just a little bit about Lopez Island might use different words. Hard working people, sustainability and community are a few that come to mind for me after my visit to Horse Drawn. Thanks Tim for more insights into the culture of Lopez. As I HAVE SAID BEFORE LOPEZ IS VERY UNIQUE WITH MUCH DIVERSITY , VISIONARY AND CREATIVE PEOPLE! WHAT A GREAT PLACE TO RAISE A FAMILY! I would love to be there. It brings back so many memories from my youth. Thank you for the insite to Lopez Island.